For my work this week, I wrote a long article about performance anxiety, where it comes from, and how to overcome it. 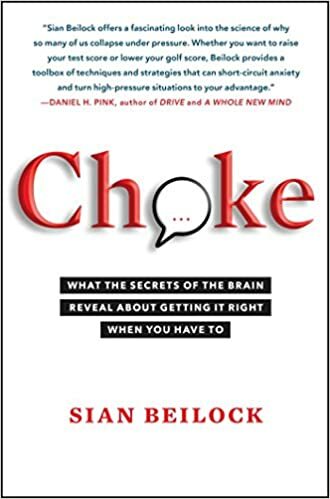 It was largely based off the book Choke: What the Secrets of the Brain Reveal About Getting It Right When You Have To, by University of Chicago Cognitive Psychologist Sian Beilock. My article will be published at some point in next few weeks at Premiersportpsychology.com. Another interesting part of my internship this week was taking a first attempt at writing an imagery script for an athlete preparing for competition. Through the process, I learned a lot about how important it is to incorporate all the sensory information available so that it is as detailed of an imagined scene as possible. The more detailed the image in the athlete’s mind is, the more prepared they will be when they are actually in the moment in competition. I was able to make one script for athletes in general, and another for a basketball player in specific. Previous PostPrevious Presentation and MatterBox Event!